This morning on my personal Facebook page I posted a cute picture. Then someone made a comment, and some more people made comments, and pretty soon the picture had a punchline. I'm pretty sure this is how Woody Allen got his start in show business. Anyway, I stole the joke from myself and made it into a graphic to post here. This way, if you're not one of my Facebook friends, you can get an exciting glimpse into my life outside of this blog. (Disclaimer: Glimpse may not be exciting.) And if you are one of my Facebook friends, then you've already seen this and you're screwed out of a new post today. Or spared a new post today, depending on your perspective and whether I should be in the market for more supportive friends. And I don't have to write any new material today. I can go back to chewing my way through the walls. It's been that kind of day. 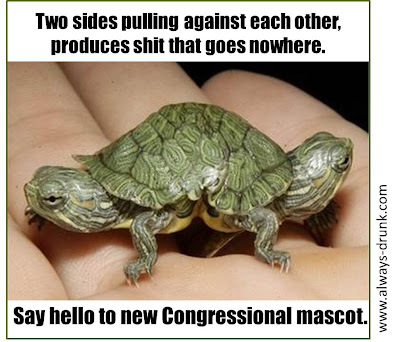 And if you don't like political humor...look, cute two-headed baby turtle!